Non-stop are a company dedicated to innovation in dog sports gear and have a team of people working for them who are very experienced in the sports they are designing products for. 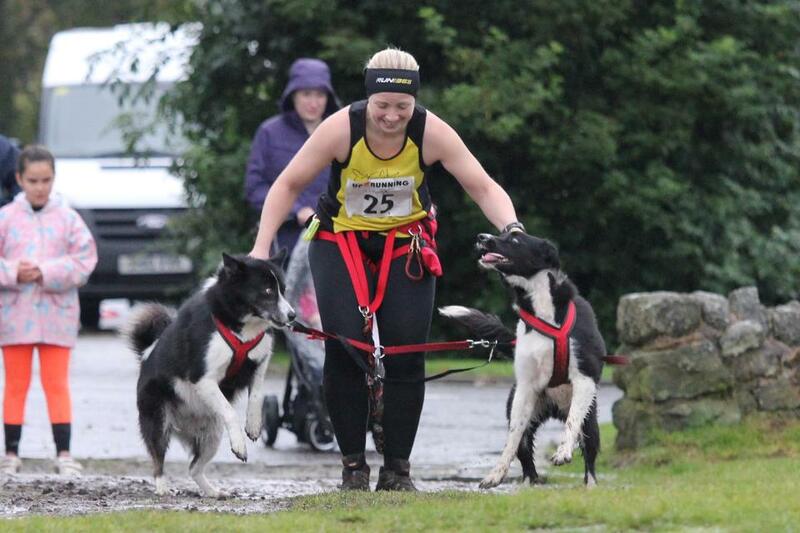 One of their best selling and unique designs is that of the Freemotion harness, designed to be used for everything from canicross to dry land mushing. I thought I’d write a little feature on this unique harness and it’s pros and cons. Firstly, there is nothing else like it on the market (except the Non-stop Combined harness) and it has distinctive attributes which set it apart from other dog harnesses on the market. 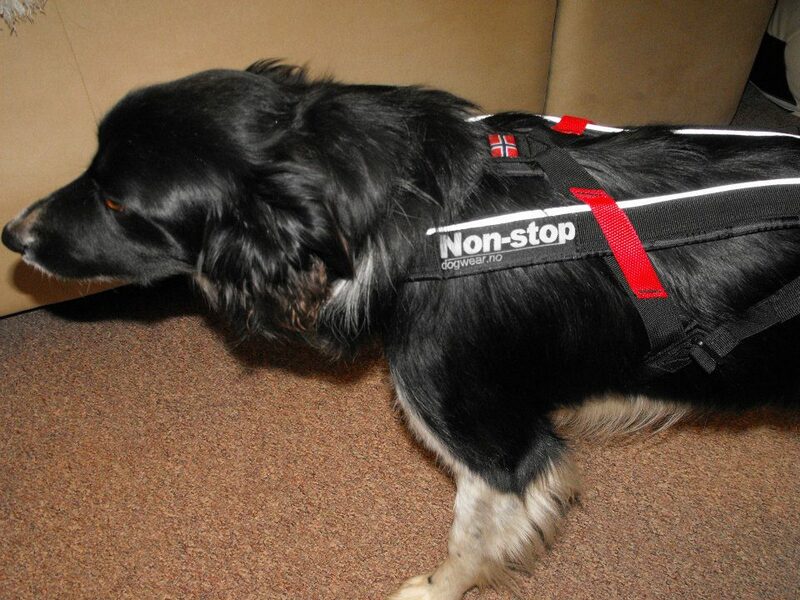 The long back pieces of the harness are padded, reflective and run alongside the dogs’ spine to allow free movement. They are also suspended and not fixed over the shoulders, which means they can move with the dog rather than restrict in any way. The back section of each side strap is elasticated and adjustable to allow your dog expansion room in the harness to breathe. There is also a velcro strap which holds the two sides together near the back of the dog, just before the last ‘tail piece’ of the webbing straps start and undoing this helps with putting on and taking off the harness. The rear webbing straps are also very adjustable to take account of varying lengths of dog and make it very good for long backed breeds. As with all dog sports harnesses the neck is fixed and the diamond shape head hole is designed to fit nicely on both slim and broad chested hounds. The Freemotion was made with the hound type dog in mind and like a few of the harnesses being produced in Europe now, caters for dogs of a different shape in addition to the traditional sled dog breeds. With all the thought and experience that has gone into this harness you can see why it is so popular with all the top European competitors who use it. The only drawback is that like all harnesses, the Freemotion does not always suit all dogs and some people report back that it just doesn’t sit right on their dog. I have found that with the majority of the people who have experienced this, the harness can be adjusted so that it can fit correctly and the fact it is so adjustable means it can sometimes be more difficult to get this right the first time of fitting it. 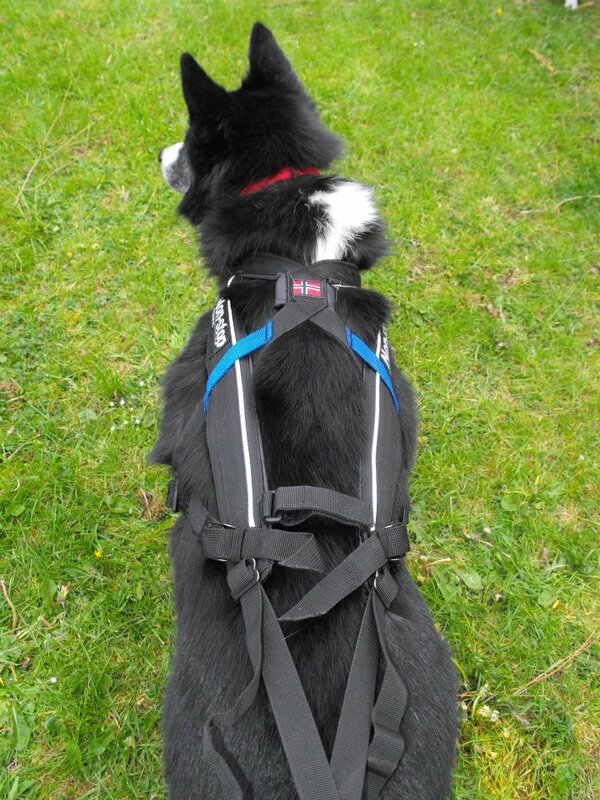 I have also had feedback from people that the neck is too tight on the harness in their dogs’ recommended size but as I have mentioned in many of my previous articles on harness fit, the neck needs to fit snugly to allow the harness to work properly without sliding up into the throat or down onto the shoulders. As more people take up the sports of canicross and bikejor, more people are joining the races we attend and the more important it becomes to be a conscientious canicrosser. What I mean by this, is the awareness of the impact you and your dog have on others around you and the ability to ensure you don’t hinder someone elses’ run or spoil their walk by allowing you or your dog to have a negative effect on them. 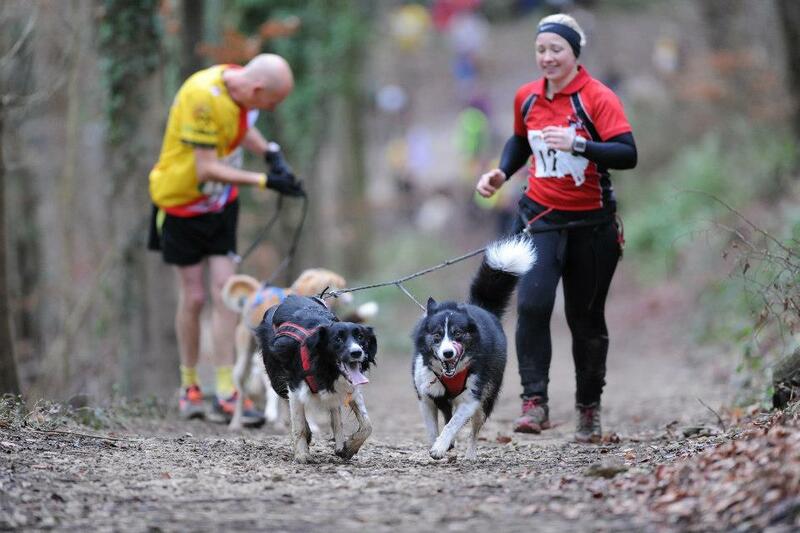 When racing, the start of a race can be quite a stressful experience, exciting too, but more often than not the noise of other dogs barking in excitement and the nerves of the runners, bikers or scooterers inevitably filters through to their dogs and results in a situation where many dogs behaviour is less than ideal. I have issues with one of my dogs who will ‘displace’ her frustration at waiting to run by mouthing any other dog who is within mouthing distance. This is not only frustrating for me (because I mainly run in the two dog class and so the dog within mouthing distance is her running partner and my other dog) but could potentially be quite damaging for another dog if I didn’t keep her under very tight control. I am constantly aware of who is around me and not allowing her to come within the range of another dog. My own dogs are used to her behaviour and do their best to ignore her but if she were to do this to a nervous or novice canicross dog, that dog could be put off from running with groups of dogs for a long time. It only takes one bad experience to cause months worth of problems. The same can be said of any dog who lunges at another during a race. Fortunately mine don’t do that, as it’s just the start of the race that winds them up and they run nicely alongside any other dog when out on the course. It is the responsibility of the dog owner to ensure that if their own dog is likely to lunge, then they pull their own dog in and warn anyone they are about to overtake that they are coming through. I have seen this work very successfully on a number of occasions and is something you have to factor into racing, as you cannot risk injury or upset to another canicrossers’ dog for the sake of a few seconds less on your race time! It is all part of racing etiquette and at race briefings we are encouraged to use various different warnings to alert runners you are coming up behind them. The traditional ‘Trail’ is used in Europe and in Mushing competitions but in the UK I prefer to say ‘Coming through on your right/left’ as it gives the person in front not only a warning you are coming through but also tells them on which side you are, so they have the opportunity to pull their dog in to their side if they know their own dog has a tendency to lunge. I also think if you are having problems with a tangled line, an undone shoelace or something similar, it is much more considerate for your fellow runners if you try to pull your dog over to the side of the track to resolve any issue. This way anyone catching up behind you can carry on by without your problem becoming their problem too! Courtesy should not be extended exclusively to the competitors either, as many races take part on public land where people may be walking their dogs or walking in general and not have realised that they have walked right into the path of a race course. I find the majority of people will move to the side and call their dogs to them to ensure they don’t hinder racers, however there are always a few who feel they have more right to be using the space than any outsiders taking part in an event. I try to warn people of my approach by calling rather than shouting and always thanking people if they show any sign of having moved to let me through. The more polite the canicrossers, then hopefully the less the general public will object to runners and bikers flying past them during their early morning stroll! The same rules should also apply when you are out training, as many people will not have seen a sight such as a runner or biker attached to dog/s before and although most will again be curious rather than angry, if you hurtle past them, narrowly missing running over their dog in the process, they may not see canicross or bikejor in a very positive way. The more the sports grow, I think the more conscientious we need to be both racing and training. If we simply ignore the other competitors or public around us, then the reputation of canicross and bikejor may suffer. It is always better to portray a positive image of the sports so peoples’ perception is always a good one.